About us. Surplus Petro Chemical, Laboratory & Industrial from Bamko Surplus in Texas City, Texas. Bamko Surplus Process Equipment LLC was established in 1994 by Bill Ketenbrink in his daughters pink bedroom which he transformed into his office. He founded Bamko Surplus on the intentions of providing great quality equipment at an affordable price to the Petro Chemical and Process Technology industry. 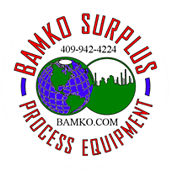 Since then, Bamko Surplus has grown to meet the needs of its customers and specializes in laboratory equipment purchases and sells. All equipment sold is owned by Bamko Surplus. We sell parts to keep your old equipment running including parts no longer sold by original equipment manufactures. We have helped established small start up labs by providing good quality used equipment at incredibly low prices in comparison to new products. Here at Bamko, we take pride in our hard work and honesty and we thank our customers that do business with around the world. We believe equipment is considered used after one use and we differentiate between used, well used and over used equipment (which is generally used for parts).